*The fabric is not faded or stained from use, missing tag. 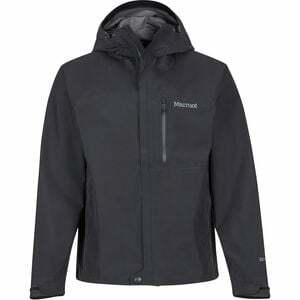 The Minimalist Jacket is one of Marmots most popular and universal jackets. Weighing in at under one pound with Paclite technology, this jacket is designed for storing in your day pack, backpacking backpack, and carry-on so that you are always prepared for high-elevation rain clouds, scattered showers at the crag, and all-day thunderstorms in the city. Waterproof Gore-Tex shell gives you ultimate protection against heavy rain while the windproof hydrophobic membrane keeps you shielded from winter winds. And Marmot's Angel-Wing Movement design gives you enhanced range of motion at your arms for climbing and comfort while hiking.